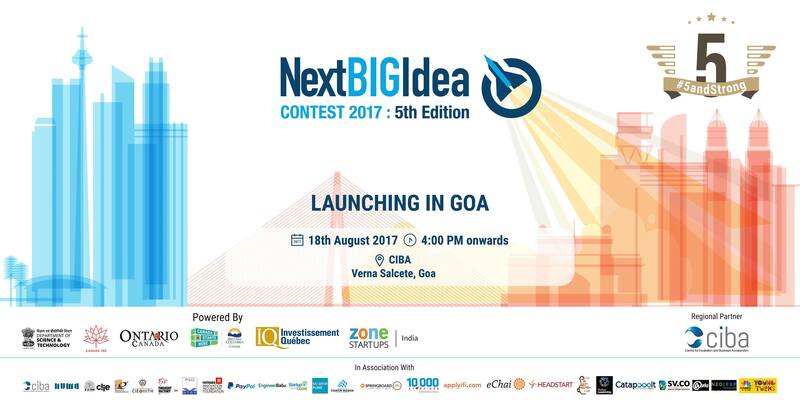 Zone Startups India is launching the 5th Edition of Next BIG Idea Contest in Goa in association with CIBA. Your startup could be one of the 5 winners of the Next BIG Idea Contest to travel on a fully paid trip, for a 2-week bespoke program in three major Canadian cities - Toronto, Montreal and Vancouver. We invite you to join us for the launch event comprising of an engaging panel discussion & networking session. The panel focuses on how competitions serve as a catalyst for any vibrant startup ecosystem. 4:35 pm - Panel Discussion: How are startup competitions building local ecosystems? The Next BIG Idea Contest seeks to discover India s 5 most innovative technology companies who are looking to leverage a soft-landing opportunity to expand to North America. The contest is a “Market Access Program”, whereby the winners get to incubate their company in Canada for a two week all expense paid program. The visiting entrepreneurs receive mentorship, business development advice, customer connects, investor access and valuable international experience. Over the past 4 years, the Next BIG Idea Contest winners have gone onto raise significant investment. Some of the past winners include CitrusPay (acquired by PayU), Vidooly, ShieldSquare, Plackal, Flip Technologies, AdSparx, Konotor (acquired by FreshDesk). Till date, NBI has soft-landed 22 Indian startups in Canada and provided them a gateway to North America. Attend the event to know more and enter the Next BIG Idea Contest!